In one of the most exciting Dodgeball contests ever, Walker's Texas Rangers rallied from an 0-2 hole with three straight victories over White Goodman and the Purple Cobras to lay claim to their first title. A near capacity crowd of about 700 people watched as the W.T. Rangers completed the task that they failed to do one year before when these same two teams met as Uncle Tony and Snow White in the 2005 Championship game. That too went to five games starting with an early 0-2 before Uncle Tony's staved off the rally. The big difference this year however, was the play of the W.T. Rangers T.J. Humrich who earned Most Valuable Player honors for stirring the comeback, as well as for keeping the Rangers alive against the Trenchtown Wailers in the quarterfinals. In the Wailers game Humrich and Sal Intagliata staged a five minute mano y mano battle that literally brought the fans to their feet. Humrich negated a 1 on 5 disadvantage with smart shrewd play that shocked the diasppointed Wailers who thought that they had the victory in hand. In the Championship round the third game is always the hardest to close out even though it seemed that White Goodman would cruise to the title after two easy opening wins. Nonetheless, the Rangers fought feverishly in game three to close to 2-1. In game four the momentum swung for good when the Rangers cashed in on a pin save to free all seven players who immediately and simultaneously dove to block Kevin Miller's own pin attempt. The wall of bodies flew through the air like they were shot out of a cannon. While airborne Miller's attempt was deflected skyward as seven players waited for its safe arrival. The spectacular play completely knocked the wind out of Goodman's sails. Five minutes later it was over when Eric Vollmer failed to hold off a 6 on 1 ambush. 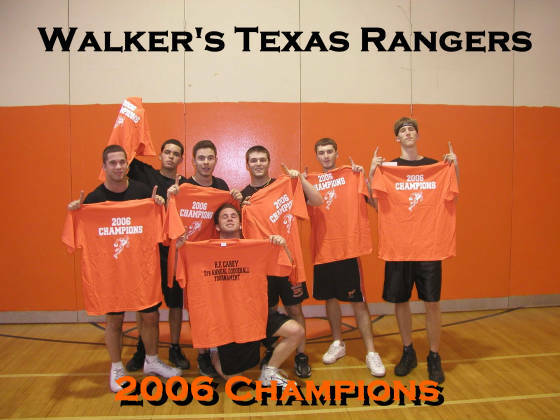 Walker's Texas Rangers were finally champs. Hello Boulder Creek! Of course what makes a tournament great is great lead up games and storylines to the finals. Certainly, Maria's Deli Boys, a 600- 1 shot was a big part of the storyline as they snagged two upsets before finally succumbing to the Rangers in the Top Right Bracket Final. Their win over the Wiseguys was downright shocking as the Wiseguys were completely dismantled. Also adding to the fun was In Stamos We Trust who pushed the Rick James Disciples all the way to the brink in the Top Left Bracket. Rick James then got caught up in a tough ruling when an exiting player knocked down an incoming pin attempt to help Goodman advance to the final. Also getting hurt by a controversial ruling was NJBO who became the first team to forefeit a win after two consecutive Unsportsmanlike penalties. The plain and simple truth is that the Dodgeball Tournament is a year to year operation that can not afford to allow foul language and inappropriate behavior to exist. It is unacceptable and it can cost all of the H.F. Carey students of the future their chance at having their own tournaments. Although their were some odds off center, many odds were dead on as the 2-1 favorites won it all defeating the 3-1 runners-up. Also the elite eight held serve as the 5-1, 12-1, 12-1, 12-1, 25-1 odds all advanced two rounds. Only Stamos and Maria's snuck through the cracks as surprise teams. Adding to the unbelievable two days of excitement was the professional sound system of Tom Kublo and Mike Mollish who entertained the crowd while injecting the right tunes to get each team pumped up. Thank you Tom and Mike! The raffle was also a smashing success courtesy of Mr. Punis as Christina Salvatore assisted in picking four sets of lucky numbers for the happy fans who will now get to see Major League Baseball up close and personal. Thank you again for your very unselfish generosity Mr. Punis. Personally, I would like to thank Mr. and Mrs. LaMarca, Mr. Soto, Mr. Farina, Mr. Boyle, Mr. Giarraffa, and Mr. Hebar for making the tournament run so smoothly. Also a tremendous thanks to Mr. Monaghan and Mr. Quinlan for allowing us to have this great event. And lastly, I would like to thank the SPECTACULAR students of H. F. Carey High School for being part of such a great event without incident of any kind. Your conduct and maturity is recognized and appreciated by ALL of the teachers and administration. It is the reason that Dodgeball 2007 is already being planned!!!!!! So start picking those teams!! Some Action from Day 1. The 5th Annual picked up right from where the 4th left off. Exciting games, great plays, great action and a spectacular crowd that makes H.F. Carey the classy school that it is! The goal of Day 1 was to chop the 28 team field in half for Thursday's Final 3 rounds. There would be only one game apiece for each team and if you lost it was sayonara. After a quality win for In Stamos We Trust and their 'cute' little iron on shirts, we had our first upset when Fili's Imps came back from one game down to shock We Ate Jerry's Rice, who came in as a strong 6-1 favorite with serious Championship aspirations. Sorry fellas! maybe next year. That was followed up by wins from Sopranino, Rick James' Disciples, C-Men, and the United Nations before we had two games of the day back to back. First was the Miller vs Miller game as reigning Champs the newly named White Goodman club had to go the distance before eliminating the Pep Boyz. Next was the heavyweight bout of the tournament as the Gangsters of Ohio...All Shermed Up flattened a surprisingly overwhelmed Revenge of the Penguins squad. After a brief respite the back half of the bracket got underway with another classic as the Trenchtown Wailers finished off the Walpole Disciples in three games. Next the Fighting Mongooses succumbed to an NJBO onslaught before Walker's Texas Rangers steamrolled an entertaining Asian Invasion club. The John Maddens enjoyed victory next with a solid win over Chocolate and Vanilla Swirl. In the last quarter of the bracket the Wiseguys escaped in three over the brightly colored Real Deal before Maria's Deli Boys closed out the day's festivities with a win over the Straw Hats Crew. As planned the games ended at 5:45PM which left time for our first ever NY Yankees and LI Ducks Baseball tickets drawing. For those of you who didn't stick around long enough it was one of the craziest things that I have ever seen. We chose two tickets out of about 100 tickets or so. The first came out 313094. It produced an immediate winner, John Punis whose family actually donated the tickets in the first place. John politely declined to accept the tickets stating that "I just wanted a water not the raffle tickets." Seconds later a second number was picked, it came out 313093. Unbelievably John was the winner again...and again he refused to accept the prize. Therefore, we will have all 14 tickets available for Thursday's final drawings. They are fantastic seats to two Yankees' games, one Ducks' game and one Mets' game but you have got to buy your tickets. All proceeds will as always go to the Carey Baseball Club Fund, so thank you to all who purchased on behalf of the team. It is almost time for the event of the year: Dodgeball '06. The building has been electric for the past two weeks with anticipation and excitement. I am personally looking forward to the best tournament ever. Two great surprises have just been added. We will also now be raffling off sets of Yankees, Ducks and Mets Ticket with all proceeds going to the Carey Baseball Club. The raffle policies will be announced before the first game on Wednesday. Also there is a good possibility that the winning team will have a chance to travel to Floral Park Memorial High School on Friday June 9th to take on their Champion in the first ever Sackman Cup. Details will follow as soon as possible. Stay Tuned. And Good Luck to All. Welcome to the H.F. Carey Dodgeball Tournament 2006 Website. On behalf of the Carey Seahawks Varsity Baseball Team we would like to thank you for all of your support. The 2006 Dodgeball Tournament should be the best one yet. Slowly and steadily the interest has grown each year to the point that the tournament is one of the most talked about events of the year. This year's tournament will host 28 teams all vying to be crowned the 5th Annual Champions. The team that does get crowned will be rewarded not only with school bragging rights but our best prizes ever. The winners will receive Championship T-Shirts and a $175 Gift Certificate to Boulder Creek. In addition there will be a very unique MVP trophy awarded as well as a $25 Gift Certificate to Vito's for the Runners Up. This year's Two-Day Tournament will take place on Wednesday June 7th and Thursday June 8th from 3:20PM-5:45PM on both days. For the first time there will be a $1 Fee to enter. Your Coupon Ticket will be valid for both days. If you lose it then you will have to pay both days. Players are obviously all admitted for free. The Carey Audio Crew will be on hand to help with the sound system. For those of you with bad hearing you might want to bring earplugs because the energy and decibel levels will rock your eardrums. As far as the games go, the rules will be the same as in gym class. However, the only difference is there will be several officials to assist in making sure the games are played as fairly as possible. Of course all disputed calls will be addressed by Mr. Hedquist whose word is law and completely Non-Negotiable. Those who do not consent to the rules of the tournament will be escorted and shermed out of the building! Basically, once you are playing, the game takes care of itself. So best of luck and enjoy yourselves! Last year's Champions Uncle Tony's Perkis System, who talk enough garbage to put Oscar The Grouch out of house and home, return all the members from a year ago and open as a 3-1 shot to defend their title. However, they have added one new wrinkle. They will now be known as White Goodman's Purple Cobras. Unfortunately for them they have landed, by luck of the draw, in the hardest bracket in the tournament. It is for this reason that I believe they will fall short in their quest to repeat. Sorry Sports Fans but the team to beat this year will be the 2-1 Walkers' Texas Rangers captained by Mike "Sunshine" Sands who not only have the best athletes from four different sports but a relatively easy bracket as many of the new teams have been found matched up against this juggernaut. In addition to White Goodman's Purple Cobras, Gangsters of Ohio...All Shermed Up 5-1 captained by Frank Intagliata and Revenge of the Killer Penguins 5-1 captained by Jesse Pulice both find themselves stacked up in the same bracket and will watch as one them causes the other to exit the building. Benefiting from an easy bracket is Rocking Rosini and the Best of the 80's Hair Bands (We Ate Jerry's Rice) 6-1 who will meet a little resistance from Fili's Imps 12-1, Rick James Disciples 15-1, or Underdogs Revenge 15-1 but should still get through to the Final Four. The Debonis Gang-Men With Hats 10-1, Trenchtown Wailers 12-1 and NJBO 15-1 might take a game from Walkers' Texas Rangers if they get that far but not enough to escape the bracket. Brian Gottlieb's C-Men 25-1 just doesn't have the power to get through a monster bracket. Mike Miller's Pep Boyz at 200-1 will lose in the first round at the hands of Mike's older brother Kevin of White Goodman. However, there is no need to fret Mike the Goodmans might be following shortly thereafter. In Stamos We Trust 200-1, The 'A' Team 250-1, The Fighting Mongooses 250-1, Grip It and Rip It 300-1, Chocolate and Vanilla Swirl 350-1 all have Carey Sports athletes on their team so they might steal a win but that will be about it. The Real Deal 475-1, United Nations 500-1, Maria's Cold Cuts 600-1, and Sopranino 750-1 will all crash hard but gain valuable experience for next year's tournament. Papa Smurf and the Blue Crew 1000-1, Hung L's Dojo 2000-1, The Straw Hats Crew 3000-1, and the Asian Invasion 5000-1 all have brilliant names but no where near the horses they need to be considered serious threats. Regardless, the teams will all play hard and provide us with an outstanding finish to the school year. The DeBonis Gang-Men With Hats 17. Walker Walkers' Texas Rangers 22. Madden The John Maddens 23. Chocolate and Vanilla Swirl 24. Maria's Maria's Deli Boys 27. The Straw Hats Crew 28.